A LAMP consists of Linux Operating System, Apache web server, MySQL Database Server and PHP, is a web stack in which software are installed together so that it can be used for hosting web content. For this tutorial, I am using DigitalOcean droplet with 512 MB RAM. Install Latest Apache on ubuntu 16.04. Install latest MySQL in ubuntu 16.04. 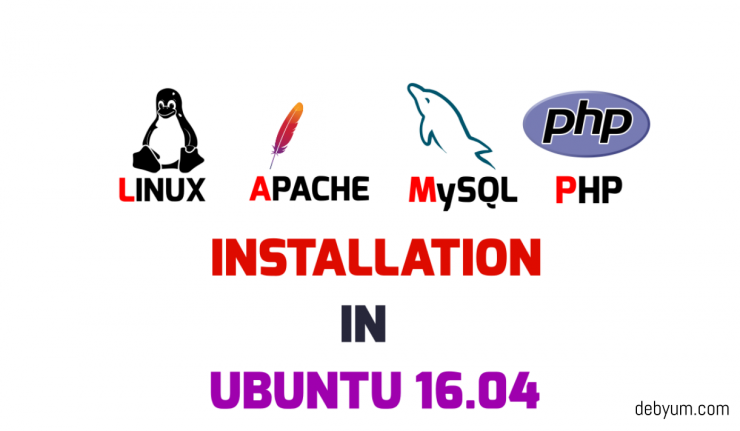 Install PHP in ubuntu 16.04.
we will install Apache 2.4 in our Ubuntu 16.04 server. This module operates on the full URLs (including the path-info part) both in per-server context (httpd.conf) and per-directory context (.htaccess)and can generate query-string parts on result. The rewritten result can lead to internal sub-processing, external request redirection or even to an internal proxy throughput. we will enable the PreFork Module as Php uses prefork module by default. But the default multi-processing module (MPM) for Apache is the event module and before enabling prefork module we need to disable the event module. To disable this module we will use the a2dismod command. Restart Apache to implement your changes. First thing first, we will take care of an annoying warning message about not being able to reliably determine the server’s fully qualified domain name, which appears during restarting Apache server or checking for syntax error. Also Allow Apache through Ubuntu Firewall. [email protected]:~# sudo ufw allow in "Apache Full"
After installing Apache, we can now proceed to install MySQL server.MySQL is a database management system. The default version of MySQL server provided in Ubuntu 16.04 is MySQL 5.7.x. MariaDB 10 is also available in Ubuntu repositories. To install MySQL, we can use. Start Mysql server and also enable it to start at reboot. Check this post : Complete Guide To Install, Update & Disable Strict SQL Mode In MySQL 5.7. PHP is used to run scripts, connect to the Database server ( MySQL ) to fetch data and process all the data to display dynamic content. we will install additional packages so that our PHP can connect with MySQL database and these packages are often required by most of the applications. To test the working of PHP , we can use this code to display PHP related info of your server. With LAMP stack installed, you can now install a different kind of applications or CMS like PrestaShop or a website on your server. And if you want are in little bit hurry to install LAMP on Ubuntu 16.04 test server then you can visit Page 2 of this article. I have tried to cover all the basic to advance concepts with their examples. Still, if I have missed anything please update us through comment box. I will keep updating the same based on feedback’s received.